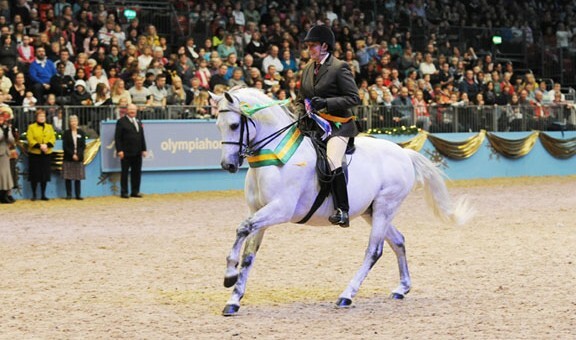 Simon and Shirley Young's lovely grey stallion Farriers Finger Print, pictured above, has the distinction of being the first and only New Forest pony to have stood Supreme Champion Ridden Mountain & Moorland Pony at Olympia, in 2009. Hopefully he won't be the last forester to win! Of course it is a huge achievement just to qualify for Olympia and certainly worth keeping a permanent record of those New Forest ponies that have qualified. Sadly this list is incomplete, but surely there are people out there who can fill in the gaps? Clicking on the name of any stallion will link to his page on nfstallions.info, provided that there is a page for him. Photos of mares and geldings can be added if anyone would like to send them in - contact via the facebook page or the forum on here.